"Everyone wants freedom." A trailer has debuted for an indie sci-fi film titled Virtual Revolution, which first premiered in 2016 but is just now trying to get a release. The film also goes by the title 2047 - Virtual Reality in the UK, but I suppose the "virtual reality" in the title is a bit confusing, so they're using Virtual Revolution instead. Virtual Revolution is set in Paris in 2047, where most of the population spends their time online, connected into virtual worlds, and don't care anymore about reality. One "hybrid" (meaning he spends half in the real world, half in the virtual world) agent, who works for the companies that run these virtual worlds, tracks down terrorists who threaten the system. The basically seems like a nice indie mashup between Blade Runner and Ready Player One. This stars Mike Dopud, Jane Badler, Jochen Hägele, Maximilien Poullein, and Kaya Blocksage. Worth a look, though I'm not sure if it's actually any good. In a world where most of the population spend their time online, inside virtual worlds, Nash is a hybrid. Half of the time online, the rest of the time, in the real world, he is a private investigator/killer, hired to track down and eliminate the terrorists who threaten the system and who killed his girlfriend. Torn between the past and the future, between virtual and real, Nash ends up having to take some decisions that will impact his life, but also the society he lives in. 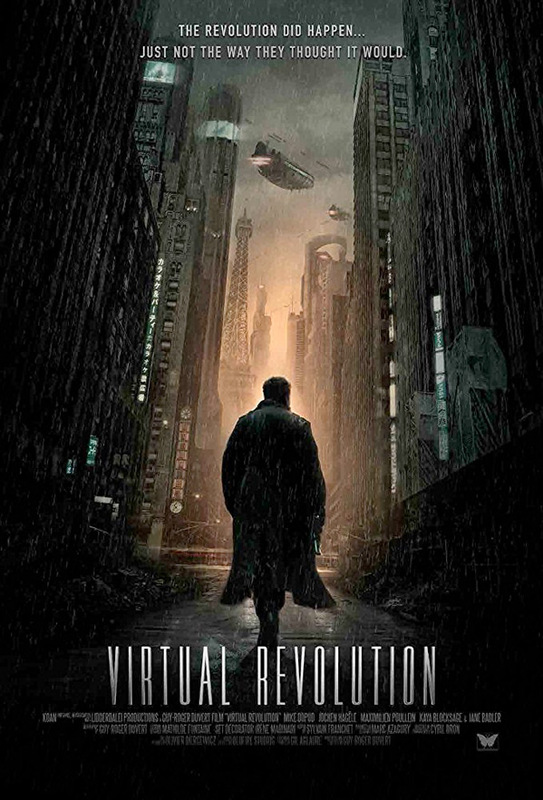 Virtual Revolution, also known as 2047 - Virtual Reality, is both written and directed by French filmmaker Guy-Roger Duvert, a composer now making his feature directorial debut after a short film previously. This first premiered at the Dances with Films Festival last year, and also played at other various sci-fi/indie festivals throughout last year and this year. We don't know if it has an official US release date yet, but stay tuned if you're interested in this. What do you think?